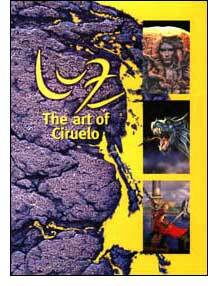 Ciruelo's third book of fantasy art, containing over 160 full colour illustrations. It includes his covers for two novels written by George Lucas and Chris Claremont: Shadow Moon and Shadow Dawn, as well as designs produced for rock guitarist Steve Vai. A small selection of his best paintings from his two previous books from Paper Tiger can also be found, as well as a complete chapter devoted to his latest project 'Petropictos', the art of airbrushing on stone.